Update: I wore the black one shoulder dress to the wedding, however I showed up and um, the wedding had been the day before. Who does that? Well, I guess I do!! As many of my girls know, I am heading to a friend's wedding in Boston in a couple weeks. I am SO excited to get dressed up and see old friends. My challenge is not overdoing it. You see, I work from home so every social occassion or soiree is an excuse for me to slip into those cute heels or some trendy item that stares at me in my closet when I am wearing PJ pants, no make-up and Uggs. Challenge: Attending wedding in early evening, friend of groom, boyfriend not attending. I went to Bluefly.com and shopped and shopped and ordered some dresses, all of which felt too pricey. I am on a VERY tight budget so just buying a dress seemed like an alcoholic drinking an O'Douls. I sent most of them back, they just weren't cutting it. I kept two. 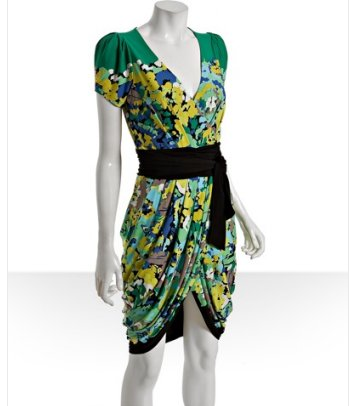 One green dress from BCBG (a personal fave) and a one-shoulder black sequined dress. I LOVED the black sequins and so did my friends but is it too much for a wedding? It's not black-tie. Today, after many back and forths in my head about what dress to wear, I ordered another dress after seeing it on Jillian Harris (yes, the old Bachelorette who always looks so CUTE) The Possessionista (www.possessionista.com) found it for me after I tweeted her. Amazing blog, so connected. Anyhow, what are your thoughts on the 4 options? I may still be shopping this weekend too. Oh, I like to wear color or something that pops, that is why nothing is really just a solid color.